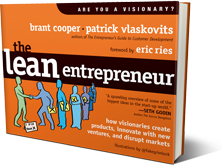 Without our early adopters, who believed enough in The Lean Entrepreneur to pre-order a book when it was merely a landing page with a silly video, we might not have survived the process of writing and publishing this book. Their early feedback on content and exercises forced us simplify, focus and hone in on how to move the needle for them. Email hello@leanentrepreneur.co to see your logo here. "The Lean Entrepreneur cruises at 50,000 feet with a view of the context we are operating in today's economy. At the same time, it dives deep into key ways the new startup tools, frameworks, and mechanisms can be leveraged to take advantage of a world filled with uncertainty and opportunity."